Scant hours after publication of Hillary Clinton's self-serving rationalization before a South Dakota editorial board for staying in the race for the Democratic Presidential nomination at least through June because "We all remember Bobby Kennedy was assassinated in June", this red-blooded defender of a pure white America withdrew his handgun from his saddlebag and stuffed it into his back pocket, ready for whatever was necessary. And he did this mid-day in broad daylight while stopped for a red light at a busy intersection in Evansville Indiana. 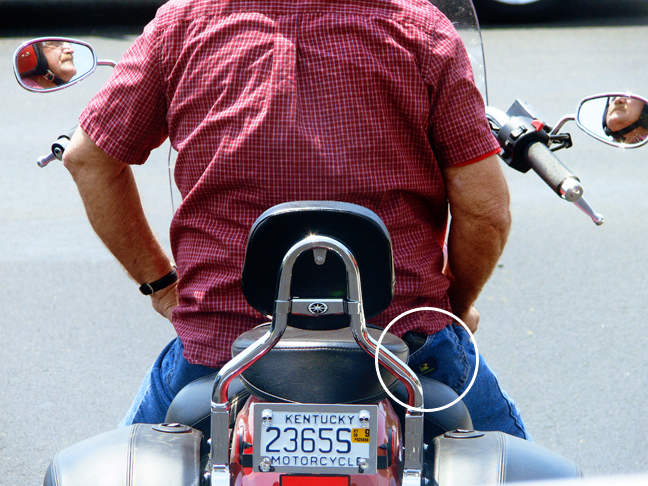 Without being stopped or questioned, he then proceeded to ride across the river into his home state of Kentucky. The culture of fear in America, bred and nurtured within right-wing reactionary true-believer thinking, is real. The possibility of armed conflict on America's streets this summer over a variety of issues including high gas prices, loss of jobs, economic uncertainty, class resentment, immigrant resentment, anti-intellectualism, homophobia, religious intolerance, and racial hatred, is also unfortunately quite real. It appears that our leaders, what few we have left, are going to have their hands full. And it isn't going to be easy for the rest of us, either. The George W. Bush initiated down-slide of America apparently continues in earnest.